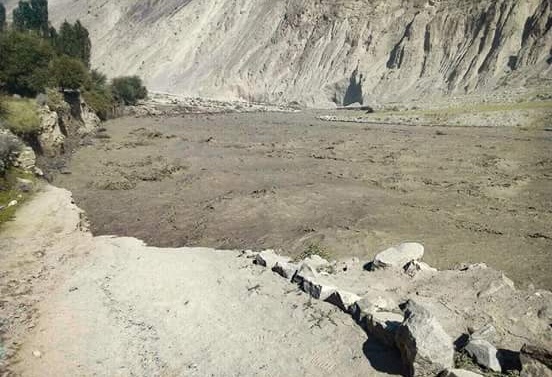 GILGIT : Glacier surge in Barswat area has blocked the flow of Ishkoman River in Ghizer District of GB by creating a dam of about two kilometer. According to reports , flood water has submerged over many houses and caused huge damamges to properties and local infratructure. According to latest updates from Budswat area of Tehsil Ishkoman, District Ghizer, where a massive flood has affected up to 21 households, and also damaged property. No loss of life is reported, because the locals were evacuated in time by the local Community Emergency Response Team (CERT) and officials of the district administration.